"This extraordinarily readable, cohesive text presents twenty-first century astronomy as a dynamic story of theory building and theory testing, as a fascinating process of observation and discovery. The authors' primary goal is to build students' scientific literacy by emphasizing how science works and why it is relevant, rather than by cataloging a large mass of individual details. 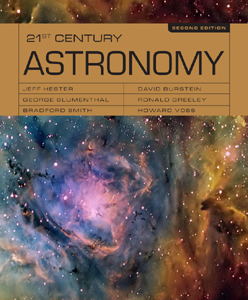 With a clear focus on core concepts and carefully crafted pedagogical aids, 21st Century Astronomy chronicles scientists at work on the most important questions about the Universe, highlighting the excitement of making new discoveries and the puzzlement created by new lines of inquiry."